Step 1: Take all the upper case letters and place them on one side of the cookie sheet spacing them out exactly how you want them. Step 2: Go through and lift each letter and replace it with a letter drawn on the cookie sheet in black sharpie. I tried to write the letters in the similar style that the magnetic letters came in. Step 3: On the back of the cookie sheet I repeated the same process with upper case letters and wrote out our children’s names. Step 4: the same process on another cookie sheet using the lowercase alphabet on the front of the cookie sheet and doing numbers 0-9 on the back of the cookie sheet. 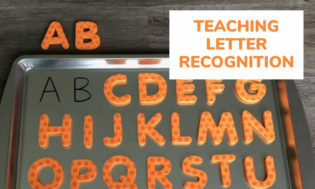 With the magnetic alphabet letters that we purchased off amazon it came with two full sets of upper case letters, three full sets of lower case letters, some extra vowels, shapes, symbols, and two full sets of numbers 0-9. I was able to do a board for each of our kids that are old enough to start practicing letter recognition. They are enjoying practicing learning letters and numbers this way. For them to each have their own board makes it even more fun for them. 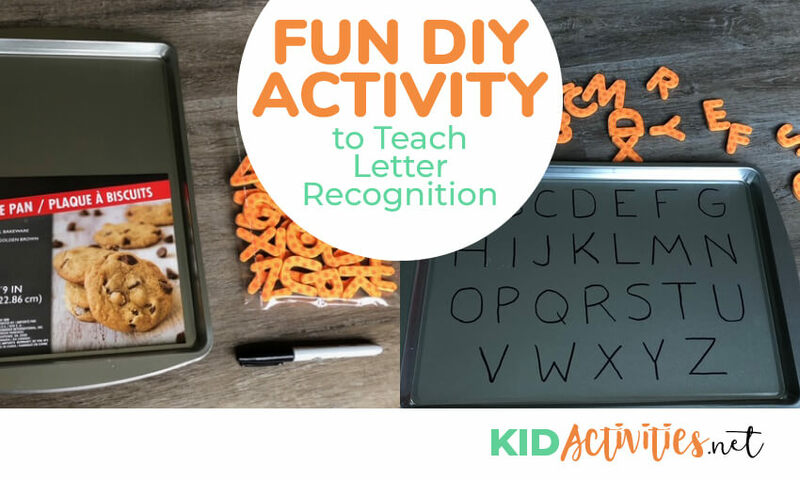 This DIY letter recognition activity allows our children to practice the upper and lower case alphabet, name spelling, and numbers.